The statewide strategic plan to reduce child maltreatment and secure family well-being is available online. The plan, Task Force on Essentials for Childhood: Safe, Stable, and Nurturing Relationships and Environments to Prevent Child Maltreatment, offers recommendations for implementation within the areas of raising awareness and promotion, using data to inform actions, and changing social norms and policy. 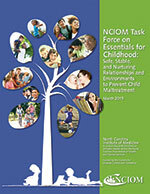 The North Carolina Institute of Medicine (NCIOM), in collaboration with the North Carolina Department of Health and Human Services (DHHS) Division of Public Health (DPH), convened the statewide Task Force on Essentials for Childhood. Just as NCIOM asserts that safe, stable, nurturing relationships and environments are fundamental to healthy child development, we believe the same. Our mission is to support an environment where children live healthy lives. To learn more about the John Rex Endowment's goals, read our five-year plan, Our Plan for Impact: 2013-1018.